Milea Hayes and Lauren Young, co-owners of Bohemia in downtown Urbana on Thursday, April 10, 2014. After owning multiple shops in California, Laura Young moved to the Champaign-Urbana area where she met Milea Hayes. Also a store owner, Hayes found she shared an interest with Young: vintage retail. 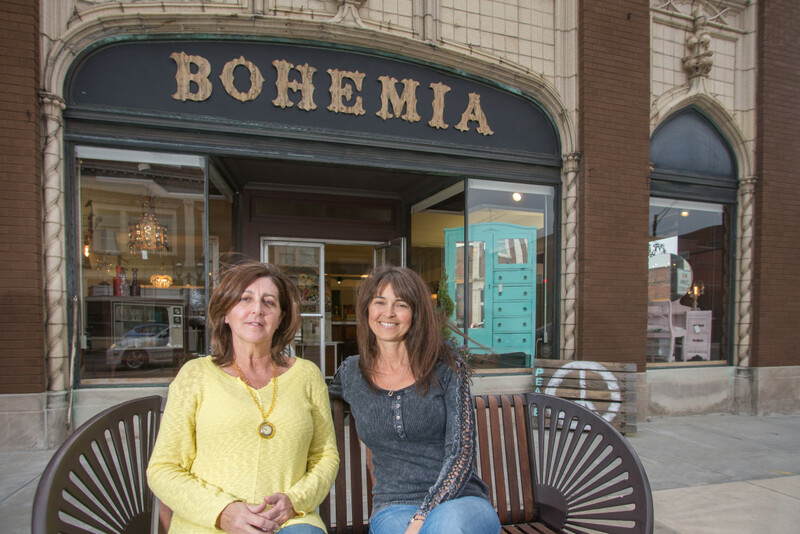 Together, the co-owners opened Bohemia, a boutique on 135 W. Main St., which offers vintage furniture, artwork and clothes. The shop debuted in November 2013. “I feel like this downtown area is growing, and we felt we fit the style of what we are doing,” Hayes said. In the Urbana City Council and Mayor Goals report updated in May 2012, the city proposed addressing empty and underutilized buildings. The aim was to consult a list of vacant buildings in Urbana and encourage their development and use. One way the city planned to promote its buildings’ reuse was to act as a developer by purchasing unused buildings and redeveloping them. Another was to preserve existing businesses while attracting new businesses to occupy buildings in Urbana. Bohemia was among the new shops to fill an Urbana building. When Bohemia opened its doors, it received a Business Development Grant of $2,000. Hayes said the funding helped the business with start-up costs, ranging from utility bills to setting up an account for the store to accept credit cards. “In Economic Development, we’ve been working with a lot of the businesses downtown on incentivizing … to bring buildings back,” Elizabeth Tyler, director at the City of Urbana’s Community Development Services, said. Community development provides financial incentives programs to encourage businesses to move or open in Urbana through its Economic Development Division. Business grants like Bohemia’s are offered on behalf of the city’s Tax Increment Financing District Incentive Programs. To apply for the financial incentive, businesses must be situated in TIF districts 1, 2, or 4. Before receiving the grant, they are expected to consult either the Small Business Development Center or East Central Illinois SCORE for counseling services. Priority user businesses – which include retail shops, restaurants, hotels and museums – may also apply for the $1,000 Business Opening Grant. “These grants can help reduce some of the burden on new businesses and ensure that they have gone through business planning,” Kate Ferrer, Economic Development specialist at Community Development, said. Redevelopment incentives, distributed in higher quantities than Business Development Grants, helps users make capital improvements to their buildings. Economic Development’s goal is to award the incentives to buildings in need of extensive restoration so owners can fill their buildings. Users are eligible for up to $25,000 from the redevelopment incentive program as a priority use business and up to $10,000 under the other use eligibility program. Other use businesses in the program offer professional and personal services. If owners are planning for larger developments, they may also be qualified for the redevelopment agreement program, where incentives are negotiable. A total of 38 businesses expanded or developed in Urbana, according to the city’s Economic Development Activities Report for January 2014. Of those, 26 businesses had documented ribbon cuttings, an opening ceremony provided by the Urbana Business Organization. Then, 17 businesses collected a total of $73,481 in incentives via the TIF programs. The businesses helped to occupy buildings in Urbana, thus decreasing the number of unused buildings. In a 2012 memorandum to “change vacant structures registration fees,” Community Development Services’ Building Safety Division reported 20 buildings registered as vacant in the city. Additional expansions in 2013 included Transitions, a thrift store that sells used clothing and furniture and Common Ground Food Co-op, a food market cooperative. Featured openings were The Urbana Butcher Shop and Dr. G’s BrainWorks, a shop at 114 Lincoln Square Mall, which is focused on games, books and puzzle retail items to support brain health. Nani Baker, general manager at the game store, said the store owner chose Urbana as the city for the business after finding the Market Place Mall rent was more expensive. The business opened at Lincoln Square Mall in November 2013. Just as Bohemia did, Dr. G’s BrainWorks also received a $2,000 grant for opening a new business. Baker acknowledges the financial incentive of having a business in Urbana, but she also noted the limited foot traffic that the Urbana mall provided. While the business association’s indoor farmer’s market brought potential customers through the storefront, the manager plans to make Dr. G’s BrainWorks a destination for consumers. CU-CitizenAccess.org has begun a new initiative on providing more information on government agencies and issues. Known as Government Watch, the project is an effort by faculty and students in the Journalism Department at the University of Illinois to provide more news and information about public and nonprofit agencies. Please send suggestions on coverage of those agencies to hello@cu-citizenaccess.org.